Many of the great townhouses in Brunswick Town had stables at the rear, with accommodation for grooms, but many animals were housed in local stables. In the early nineteenth century when these houses were built, horses and donkeys were the only means of transport for people and for the movement of goods. Donkeys also were used in the summer for rides on the seafront. Donkey Mews, as the map here shows, is in close proximity to the rear of Brunswick Square and as such was the perfect location for extra stabling and accommodation for horsemen and grooms. 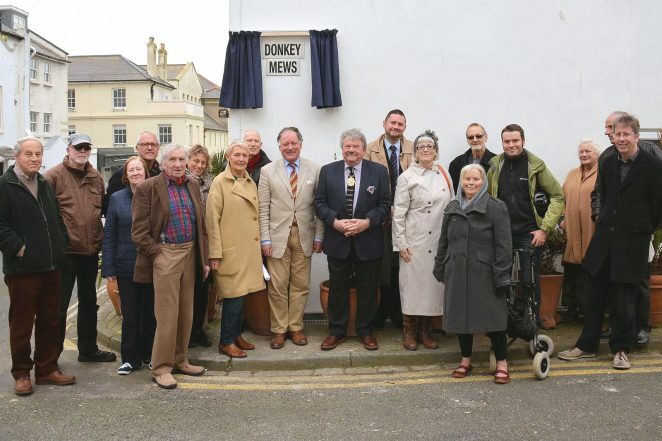 Our photograph shows the unveiling, by Councillor Bill Randall, Deputy Mayor of Brighton and Hove, of a replacement street sign, paid for by local subscription, which is more in keeping with the area than the more modern street markers. In the 1950s when I was a kid you could get through to Brunswick Sq from the end of Donkey Mews via a basement area. However, I don’t think it was actually a right-of-way.